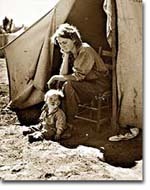 Dorothea Lange was employed by the Farm Security Administration to document the Depression through the camera lens. Her bleak photos captured the desperation of the era, as evidenced through this portrait of an 18-year-old migrant worker and her child. "Once I built a railroad, I made it run. I made it race against time. At the end of the 1920s, the United States boasted the largest economy in the world. With the destruction wrought by World War I, Europeans struggled while Americans flourished. Upon succeeding to the Presidency, Herbert Hoover predicted that the United States would soon see the day when poverty was eliminated. Then, in a moment of apparent triumph, everything fell apart. 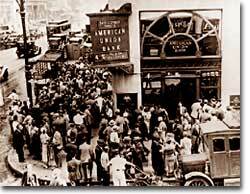 The stock market crash of 1929 touched off a chain of events that plunged the United States into its longest, deepest economic crisis of its history. Nine thousand banks failed during the months following the stock market crash of 1929. It is far too simplistic to view the stock market crash as the single cause of the Great Depression. A healthy economy can recover from such a contraction. Long-term underlying causes sent the nation into a downward spiral of despair. First, American firms earned record profits during the 1920s and reinvested much of these funds into expansion. By 1929, companies had expanded to the bubble point. Workers could no longer continue to fuel further expansion, so a slowdown was inevitable. While corporate profits, skyrocketed, wages increased incrementally, which widened the distribution of wealth. The richest one percent of Americans owned over a third of all American assets. Such wealth concentrated in the hands of a few limits economic growth. The wealthy tended to save money that might have been put back into the economy if it were spread among the middle and lower classes. Middle class Americans had already stretched their debt capacities by purchasing automobiles and household appliances on installment plans. 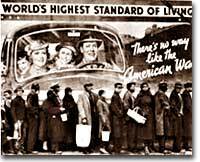 The unprecedented prosperity of the 1920s was suddenly gone, the Great Depression was upon the nation, and breadlines became a common sight. There were fundamental structural weaknesses in the American economic system. Banks operated without guarantees to their customers, creating a climate of panic when times got tough. Few regulations were placed on banks and they lent money to those who speculated recklessly in stocks. Agricultural prices had already been low during the 1920s, leaving farmers unable to spark any sort of recovery. When the Depression spread across the Atlantic, Europeans bought fewer American products, worsening the slide. When President Hoover was inaugurated, the American economy was a house of cards. Unable to provide the proper relief from hard times, his popularity decreased as more and more Americans lost their jobs. His minimalist approach to government intervention made little impact . The economy shrank with each successive year of his Presidency. As middle class Americans stood in the same soup lines previously graced only by the nation's poorest, the entire social fabric of America was forever altered. They streamed over the mountains, hungry and restless -- restless as ants, scurrying to find work to do... -John Steinbeck, The Grapes of Wrath. Next to the President, no man in the government and probably in the United States wields greater powers. -Saturday Evening Post November 1940 article on Jesse Jones, Chairman of FDR's Reconstruction Finance Corporation.